Once again I've been busy with my thesis (I'm not going to stop mentioning this all year, I bet, so apologies in advance) and forgot about blogging. It doesn't help that I've mainly been at home in track-pants and not thinking about any of the things I usually blog about. I'm actually thinking it may be time to think about having some guest posts on here and give myself a little break - I just have to find the time to organise them! Ha. I found some fully-fashioned stockings! There were a lot of seamless pairs, too, but I decided to stick to just the seamed ones. 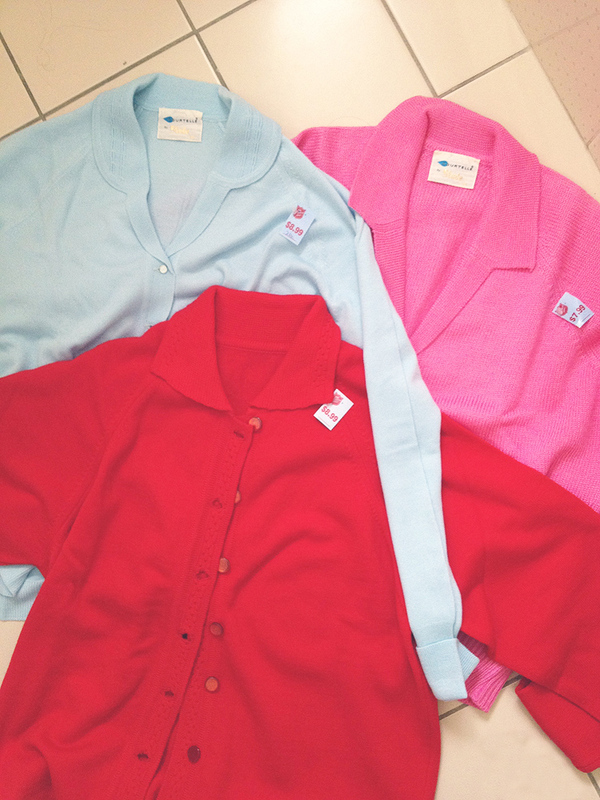 And these three vintage cardigans! Practically new. They're a little roomy but it suits this style of cardigan and you can't tell too much with the raglan sleeves, anyway. And now it's back to thesis writing to try to finish off the draft that's due tomorrow. At least it's just a draft! Oooh, those cardigans are so peachy! Love them to bits - the collar on the pale blue one is especially charming. 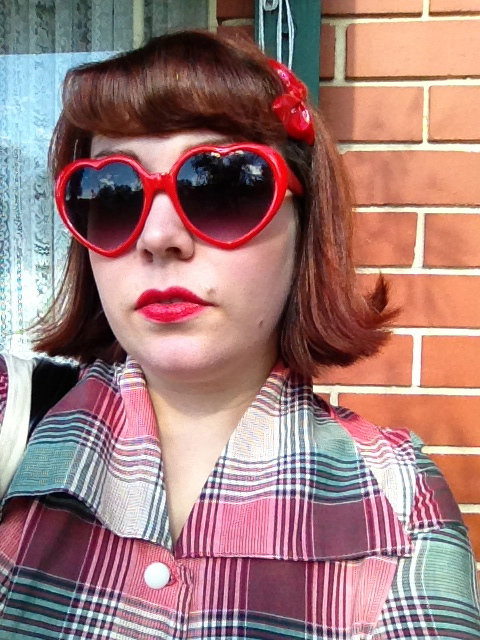 Congrats on your great op-shop finds (it's been years since I've found seamed stockings in a second hand shop). Those cardis and stockings are just awesome! I love the necklines of the cardis. 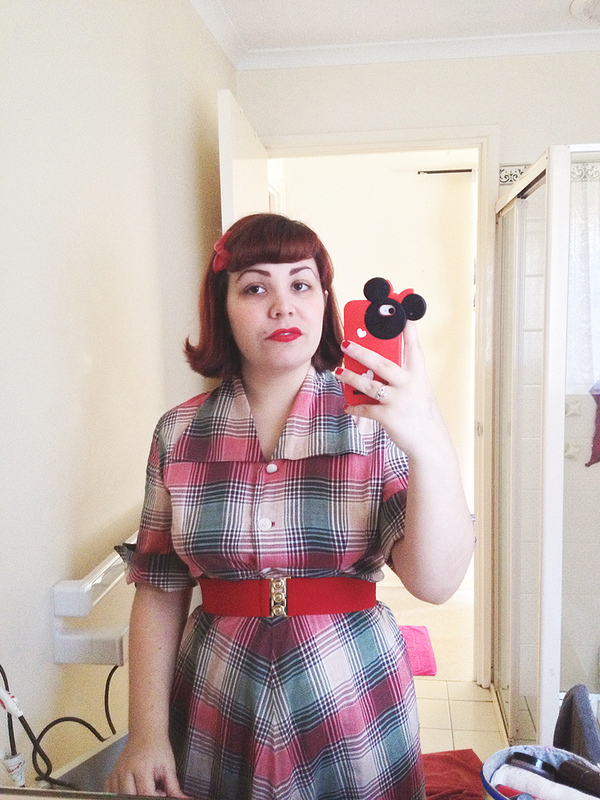 your plaid dress is awesome. it's one of the best i've seen for a long time ... and ... you did a great job at the op shop. the cardis are pretty lovely. I love your plaid dress!!! It's always give a smile when you come back from a "vintage trip" with good stuff for about nothing!!! Studies seem so far away now for me... but I can also remember my thesis year... crazy busy!!! GOOD LUCK!!! Score!! A gal can never have too many cardigans to snuggle into (or stockings for that matter... as I tear my instantly.) Quite smitten with your dress dear girl, the big collar & cuffs, plus the chevron plaid cut of the skirt = J'adore. Oh, what brilliant finds. I've dreamed of finding beautiful hosiery at the op-shop, but so far no luck! 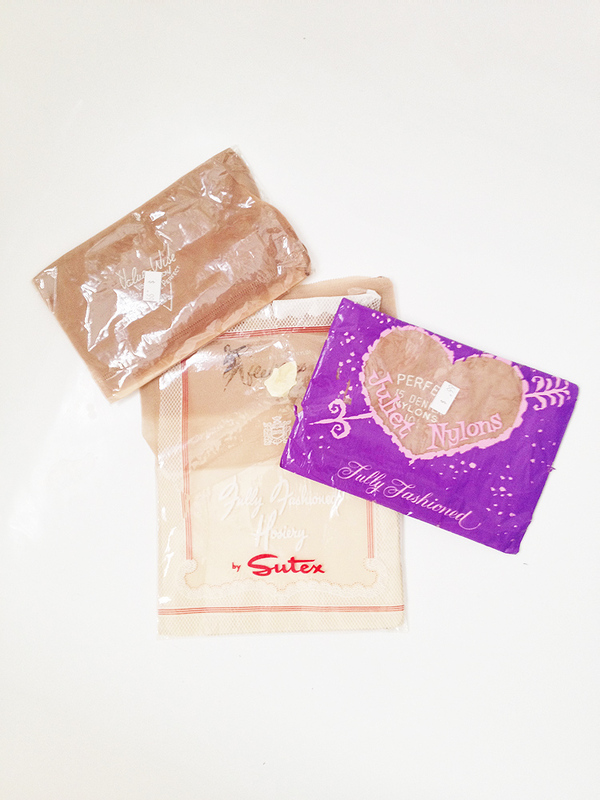 It seems like so many bloggers find great vintage fully-fashioned tights in opshops, but all I ever seem to find in the way of hosiery is gross 80s nylons in poor condition. Mad jealous.